Hey guys, so this post has been a wee bit overdue -- but it's finally here! The reason there's been such a delay is because I've been experimenting with different techniques for nighttime curl preservation that not only keep my curls for a few days, but that aren't super extensive (read: don't take 20 minutes), and don't involve a whole lot of manipulation. In my last nighttime routine video, I used my Q-Redew and Soultanicals Fluffalicious Curl Nutricious to refresh and rehydrate my day 2 hair, and then followed that up with some fancy pants banding. I was pretty much on the band-wagon (haha) since that video was made, up until a few months ago. Too much of a good thing can be bad, and I was beginning to notice that along the parts I banded, there was a little more breakage. So the crazed freak in me began searching for other alternatives to banding. I tried pineappling without any stretch on my super shrinky front parts -- nope. I tried a reverse pineapple -- just tying my hair down and leaving the ends out -- more nope. I modified banding to one big section in the front of my hair, and that resulted in even more nope. I almost took the L and went back to banding -- but then I started thinking. Most days when I'm at the gym, I use my huge Karina banana clip to pull my hair back and out of my face, and it serves me well. I wondered if it would serve me the same overnight? So for the past month, I've been testing it out. And although my hair isn't as super stretched as it would be with the banding and scarf pineapple, I'm still enjoying the way my hair turns out with this new routine. and without the increased nightly manipulation, my hair is thriving, there's no breakage, and my wash and go's last a few days longer. 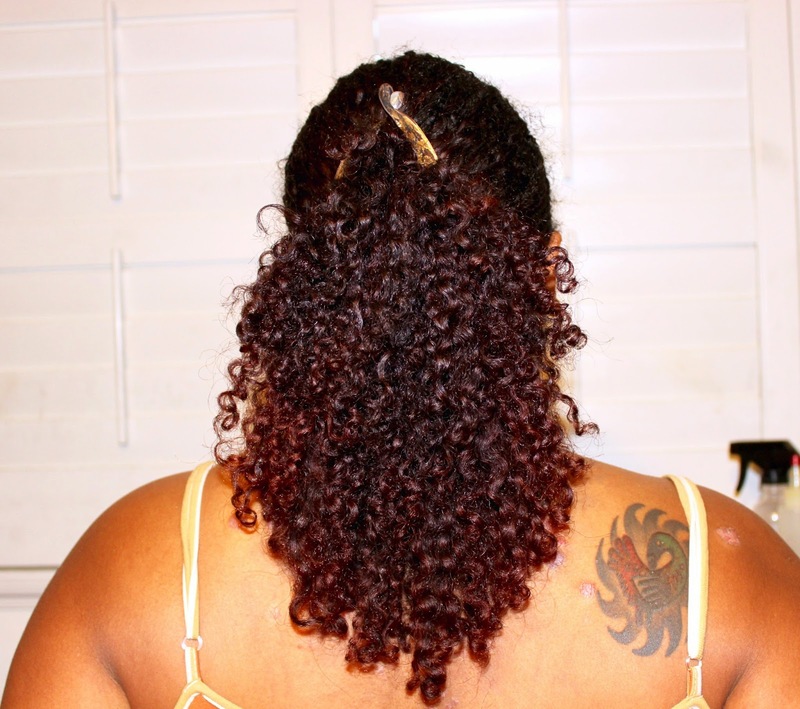 Step 1: Refresh curls with Be Kekoa Curl Refresher Spray and seal ends with JBCO. Thanks to regimen tweaks like adding Roux Porosity Control to my wash day, my hair seems less chronically dry, and I'm able to go the first 3 days of my wash and go without applying heavy moisturizer. 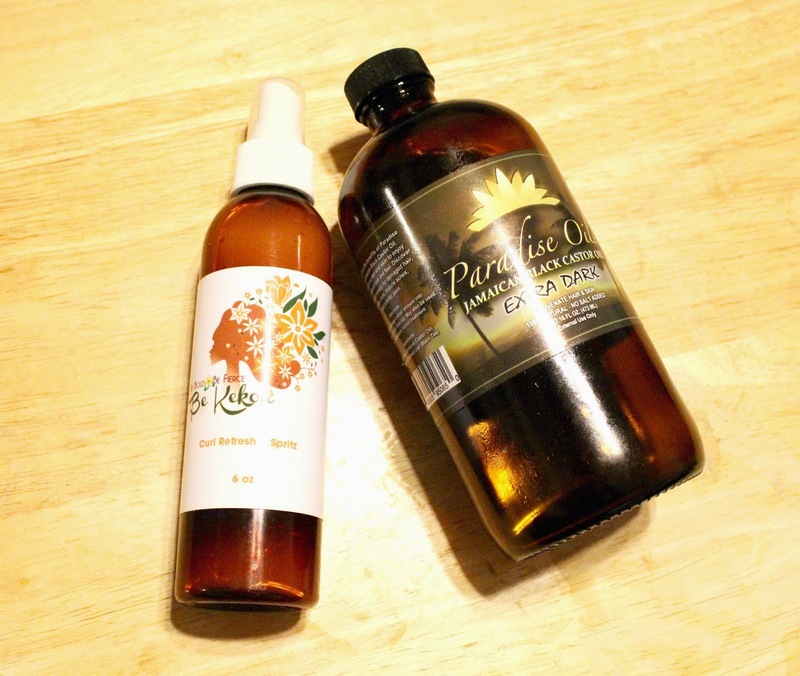 Be Kekoa Curl Refresher spray keeps my hair soft and hydrated, thanks to the aloe vera and glycerin content. If my hair is feeling especially dry, by day 4 or so I'll break out the Q-Redew and a heavier moisturizer (like one of my favorites listed here). Pretty much nightly, I rub a little JBCO between my palms and scrunch it into the ends of my curls. I discovered that scrunching oil in helps prevent frizzing and the disrupting of the curl pattern, while still protecting my ends. I also dab a little JBCO around my edges. Step 2: Secure hair within banana clip. I use this Karina Bronze Banana Clip that I purchased from Ulta. It's considerably bigger and heftier than your run of the mill banana clip, which in my opinion, makes it great for thick, textured hair. Step 3: Tie satin scarf over hair. Yes, I leave the ends of my hair hanging out. I don't find myself having too many issues with this, especially since I sleep on a satin pillowcase anyway. Step 4: Turn on Netflix. Haha, I'm kidding. Actually, I'm not. Netflix is a part of my nighttime routine. #dontjudgeme. See? Simple! Thanks to this new routine, my bedtime prep is like a minute and a half, and my curls are thriving from the decreased manipulation. The hair pulled back into the banana clip (not tight at all, I still like having my edges) provides just enough stretch to the front of my hair. 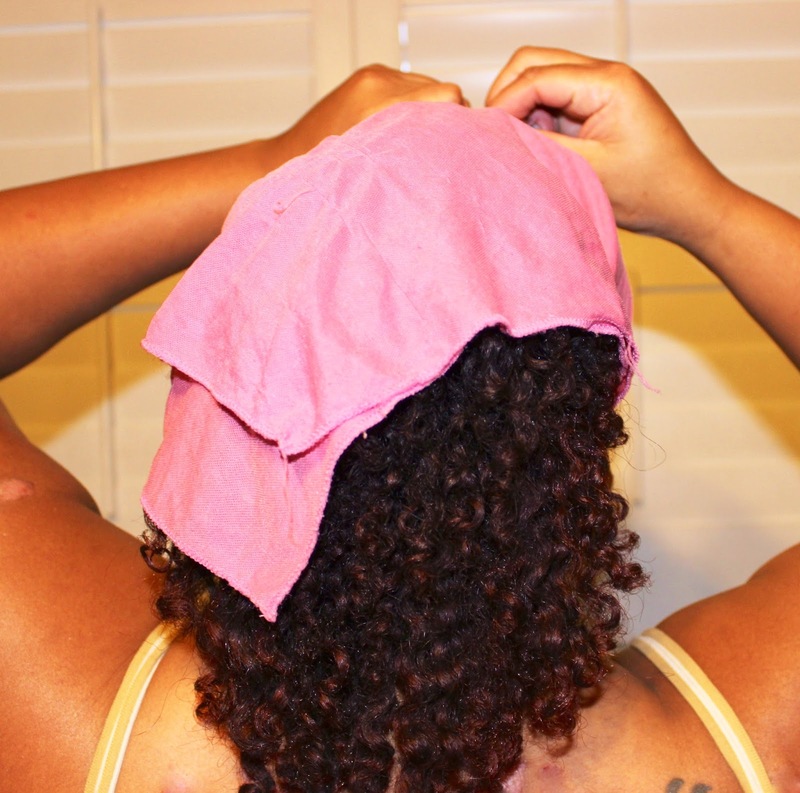 Bonus: this is a good nighttime method to try for transitioning hair, to preserve and maintain texture-blending styles. 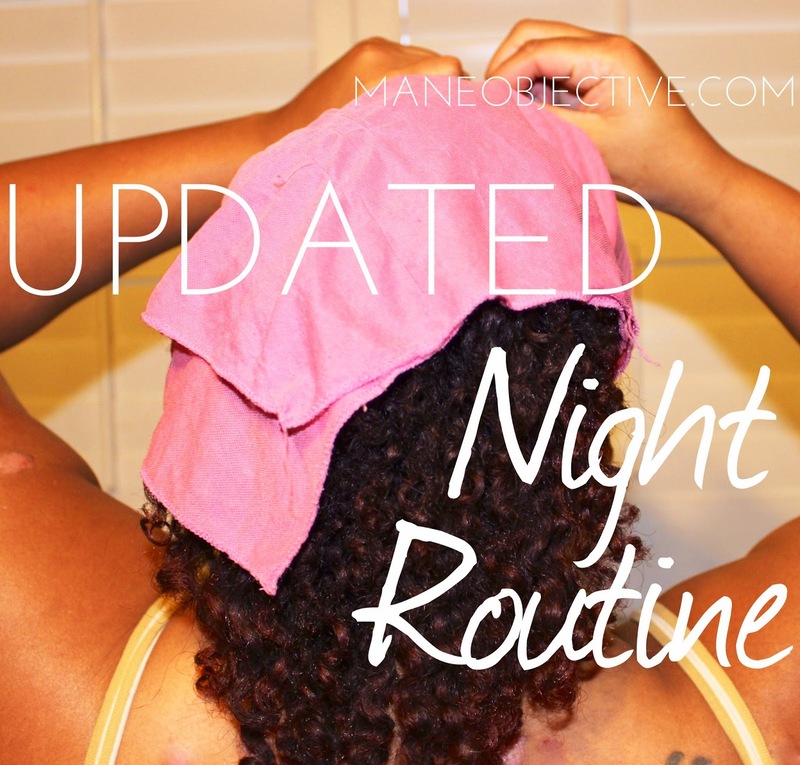 How many times have you changed your nighttime routine since going natural? Share in the comments below! I hear you when you voice concern about styling tools causing breakage but I'd be worried about the clip slowly sawing at my strands as I turned in my sleep. I don't even sleep in bobby pins anymore! Would a few loose bantu knots at the crown help? Christina, why did you stop doing the pineapple with the wig cap? I love this method.